We've seen where Harry has his origins, now we'll look at where Mary comes from. We know that Harry and Marty (Mary's brother) come from the same neighborhood as they were friends growing up. Assuming that they've not moved we now get to see where Mary and Marty lived. In the famous scene at the house, we see more than enough of Mrs. Hatch though. Mrs. Hatch seems to be on good terms with Ma Bailey, although for reasons that seem purely economical she's not so impressed with her son ... or at least in regards to dating her daughter Mary. Mrs. Hatch was played by Sarah Edwards, an actress who found herself in dozens of films through the late 30's and 40's. 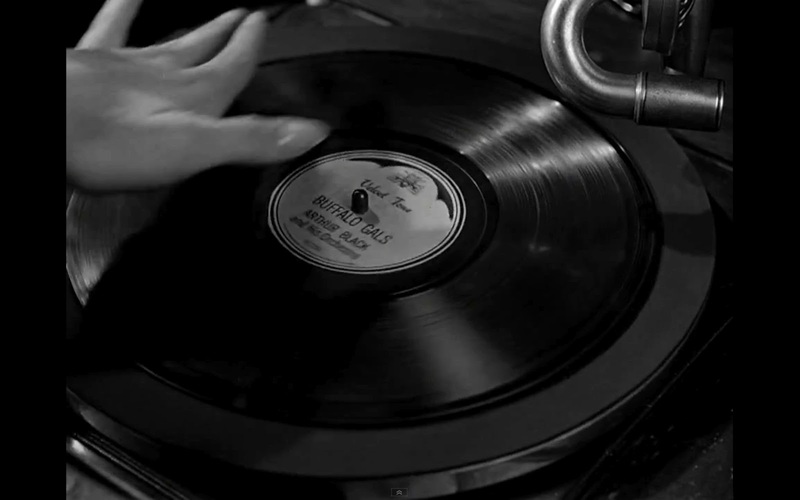 Besides It's a Wonderful Life, her other famous movie 'that includes many cross overs from IaWL' is The Bishops Wife. She's also barely in A Shop Around the Corner as well. Again, I highly recommend those movies to everyone, especially anyone who enjoys the classics. Here you can see her as Mrs. Duffy the organist in one my favorite scenes from the movie. We see Mrs. Hatch again, during the wartime montage and at the wedding send off. Hopefully like any sane or decent person we can assume she came around the greatness of George over time. When I think of her house though, I think first of the picket fence and George with his stick walking back and forth deciding what to do. 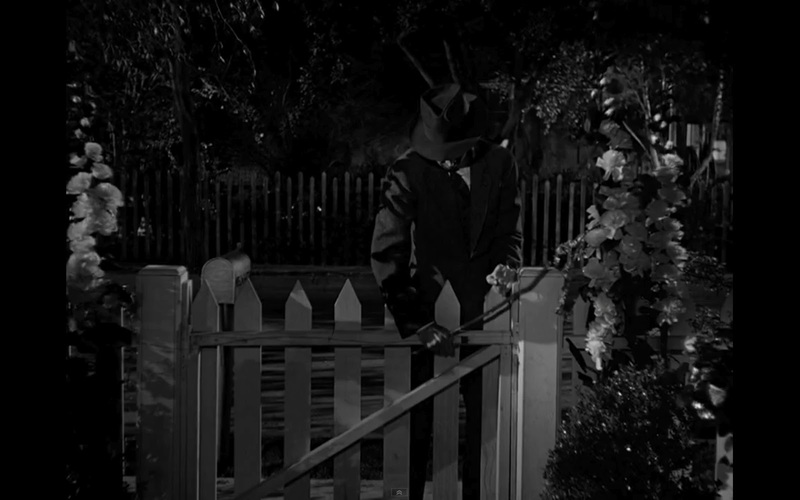 It's that white fence, and the gate he has to eventually kick open (which I love too) that distinguishes the home in my mind. George enters in a foul mood, as he's caught up in frustration over his brother's new life likely in his mind ruining his. 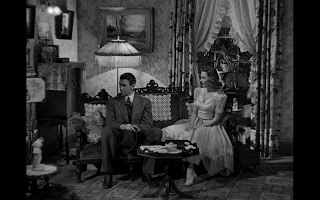 As he enters he makes the comment about Mary going 'back' to New York which might point to where Mary went to college. Quickly his mood causes Mary's sweet plans to crumble. Once entering we learn by George's off comment that the home has and does small like pine needles. As they sit in the parlor we get a glimpse of the home. One a side note. 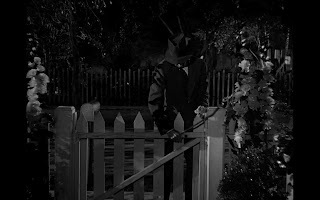 Never mentioned, and never even at his daughters wedding we have to assume that Mr. Hatch is either dead or out of the picture in the Hatch household. There is a portrait on the wall here of some prominence which might be the passed away husband and father. On the other hand, it almost looks like one of Bing Crosby's famous pictures as well. you be the judge. Hatch family parlor. Portrait upper left. This seen used to frustrate me with George's attitude toward Mary, and the odd almost awkward confrontational yet loving embrace. Most probably know about Jimmy Stewart's reluctance for his first post war on screen kiss. The dialog is as it's supposed to be, so it was many years before I came to my own thoughts. I see this entire evening as George coming to terms with his role and place in Bedford Falls. I feel that he's always been in love with Mary since that night at the school dance, but those feelings were blocked by his desire and almost inner drive to leave town and see the world. He's angry that his brother has now not only locked him back into the feeling that he must stay at the Building and Loan, but now he's got a wife, a big job in Buffalo, and college under his belt. None of which George , the older brother can lay any claim too. 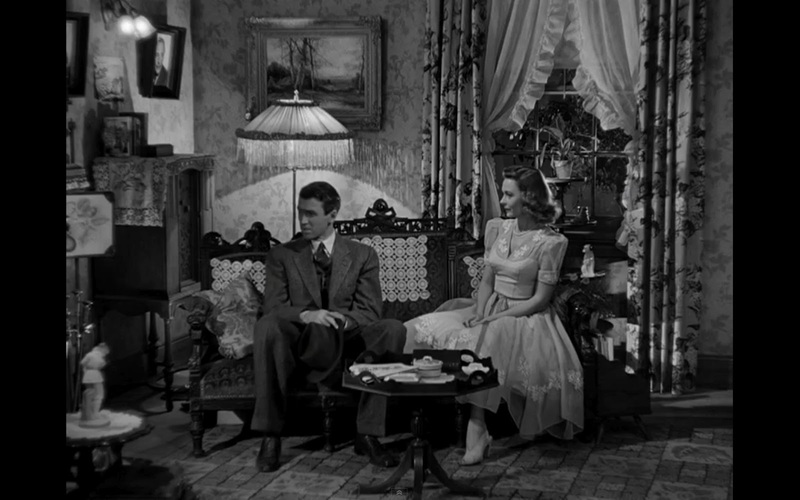 Seeing Mary at the Hatch home causes George to face his battle between wanting to leave and explore the world, or accepting life in Bedford Falls by acknowledging his love for Mary. Culminating in their embrace, George realizes ... or is really forced into realizing ... that his feelings for Mary top everything and its her that he wants more than anything else. I wish he could have seen that beforehand without taking out the frustration on her, but all is well that ends well. Besides a broken record, in the end Mary probably doesn't mind either. Speaking of that record, before the shattering of it, we can see that the Buffalo Gals record has a band by the name of 'Arthur Black and his Orchestra' listed on it. That is in reference to the film's assistant director Arthur Black who worked with Capra on many great films. Speaking again of the house. I find that Enesco delivers a great one with it's corresponding village piece. The Enesco Mary Hatch House (I don't know why they add Mary who is now a Bailey by this point) is a really nice one. It's small shape doesn't change the fact that its one of the better looking buildings. Onto the pictures and thoughts. As the normal, we'll start with the box and move on from there. The Mary Hatch House as the 2nd of 4 in the 5th series. Click the 'Read More' below to continue on to all the pictures. Enesco Mary Hatch House: Cert. Now here are some of the shots of the building. A lot of nice things about this piece. Enesco Mary Hatch House: Angle view. Love the overhanging porch and building colors. Enesco Mary Hatch House: Reverse angle. Duel chimney is great too. Enesco Mary Hatch House: Cool looking rooftop view. Enesco Mary Hatch House: Picket fences George played on. Enesco Mary Hatch House: Roof view. I like the shape and the unique aspects of the roof. And some of the lit up shots. Mary Hatch: "What are you doing? Picketing?" George Bailey: "Hello Mary. I just happened to be passing by"
Mary Hatch: "Yes, so I noticed"